Wood burning stoves have become incredibly popular these last few years with 200,000 sold annually in the UK. in order to keep them efficient as well as safe, it’s worth remembering that when burning timber, they emit tiny particles known as PM2.5 which is the most harmful type of air pollution and is linked to serious health issues such as cancer and strokes. The obvious danger is the heat generated, so always be sure to fix a well-designed fireguard around your stove to deter people and pets from touching it. Sweep your chimney every year before lighting your stove in the Autumn. This ensures that any birds’ nest or residue from the previous year is cleaned away and will also reduce the risk of fire – indeed some home insurances stipulate annual sweeping in their terms and conditions, so it may be worth checking yours. Install a carbon monoxide alarm in the same room as the stove. Finally, the obvious danger of touching or falling onto a stove can be reduced or eliminated by the use of a well designed fireguard. These range in design and price but overall, if you’ve already invested in a stylish stove, why not invest in a good looking, well designed guard for your stove? And what about the fireguard? 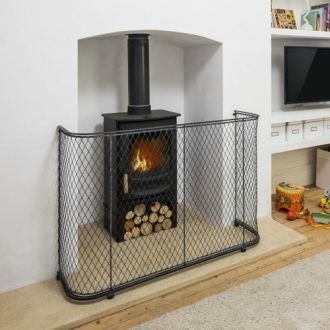 Fireguards for stoves are most effective if fixed to the surrounding fireplace or wall to ensure that they’re not pushed or pulled away from the stove. There are many available in the marketplace, but some look like mesh cages and others look like gates so it is important to consider the aesthetics of the guard as well as the function. We have two designs available – Traditional and Contemporary fireguards – both of which can be made to measure and can be delivered nationwide or worldwide. Everything that we offer is made by us in Bath, Somerset and we always look forward to the colder winter months when we can design and make all manner of bespoke designs to suit the most challenging stove and fireplace designs. Of course, the danger of bonfires and fireworks during Guy Fawkes Night are obvious but as Christmas looms, be sure not to drape anything flammable on the guard to eliminate any risk of fire as you enjoy the delights of mince pies and mulled wine!